Yesterday we completed our first school year of teaching missionary kids here at Good Shepherd's Fold. It has been a great year! We have thoroughly enjoyed the opportunity to teach and learn together with these kids. We began our last school day with our usual morning devotion time and a time for the students to pray for one another in small groups. After a morning break, the parents and some other missionaries came for our end of the year program. 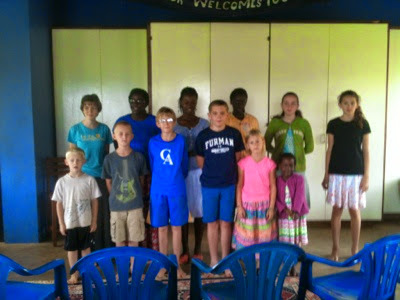 The kids recited Scripture and other memory work, read aloud, and we talked about many of the things they had learned and done this school year. It was a good time celebrating their work this year. We ended our time with snacks and an opportunity for the parents to see some of the student's projects on display. Megan Gwartney, one of our 8th graders, even made peanut butter balls covered with chocolate for the occasion. What a treat! 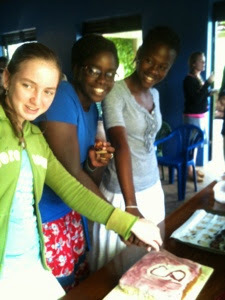 Hope and Maggie also made a cake with the number 8 since they have finished their 8th grade year and are all three high schoolers now. Claudia, who is always full of fun ideas, wanted us to take a photo of the students and teachers outside jumping up to celebrate the end of the school year. As you can imagine there were many laughs, and it took quite some time to get everyone in the air together. Here's the best photo from my camera. After the celebration was over we went to the classroom to clean up and found our students cleaning, organizing and selecting books for summer reading. We have such a great group of kids here! It is such a blessing to teach these kids! 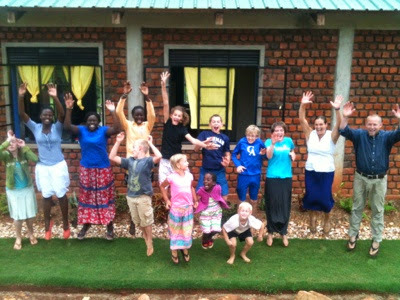 We are very grateful that so many of you make it possible for us to be here to teach these missionary kids! Robb Warfield reiterated that without us here to teach their kids, they could not continue their work here. And without your prayers and support, we could not be here. So thank you all for your role in the ministry of Good Shepherd's Fold!